LONDON, England (CNN) -- A British Roman Catholic bishop who was ordered to leave Argentina because of his inflammatory comments about the Holocaust has returned home. 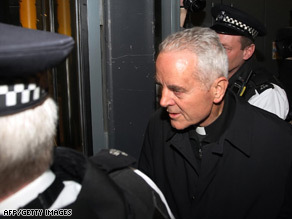 Richard Williamson is surrounded by police as he arrives in London on Wednesday. Bishop Richard Williamson flew into London's Heathrow airport from Buenos Aires where he was met by a police guard. Williamson was ordered to leave Argentina on February 19 within 10 days after he denied the Nazis had systematically murdered millions of Jews during World War II simply for being Jewish. In an interview with Swedish television, Williamson said, "I believe that the historical evidence is strongly against -- is hugely against -- 6 million Jews having been deliberately gassed in gas chambers as a deliberate policy of Adolf Hitler. "I believe there were no gas chambers," he said. The United Kingdom's Home Office, which is responsible for policing among other duties, said Williamson had a right to return home and implied he did not face arrest on his return. "We understand and respect the fact that some countries ban Holocaust denial, but there is a consensus within the UK that this is not an approach that we should adopt domestically," the Home Office said in a statement. "Instead, we believe that such behavior should only be criminal if it incites violence or hatred by reference to color, race, national or ethnic origin and is carried out in a threatening, abusive or insulting manner." Williamson is under investigation for Holocaust denial in Germany, where it is a crime. Williamson made headlines in January when he and three other ultra-conservative bishops were welcomed back into the Roman Catholic Church more than 20 years after Pope John Paul II excommunicated them on a theological question unrelated to the Holocaust. Williamson's rehabilitation sparked condemnation from Israel, American Jewish leaders and German Chancellor Angela Merkel, among others. The Vatican has pointed to several statements by Pope Benedict XVI condemning the destruction of European Jewry. The pope also has said he did not know of Williamson's views on the Holocaust when he lifted the excommunication. The mainstream Catholic bishops of England and Wales have condemned Williamson's views on the Holocaust as "totally unacceptable" and say the lifting of his excommunication was for unrelated matters. A spokesman for the Catholic bishops conference of England and Wales told the Press Association on Wednesday he had "absolutely no idea" where Bishop Williamson was going following his arrival in Britain. The Vatican has said Williamson will not be allowed to perform priestly functions until he recants his Holocaust denial. Williamson has apologized for the "distress" his remarks caused the pope, but he has not retracted them.